Origin: Originally South India, later part of the Bikaner armory. European blade. An interesting South Indian style katar with an imported European blade. 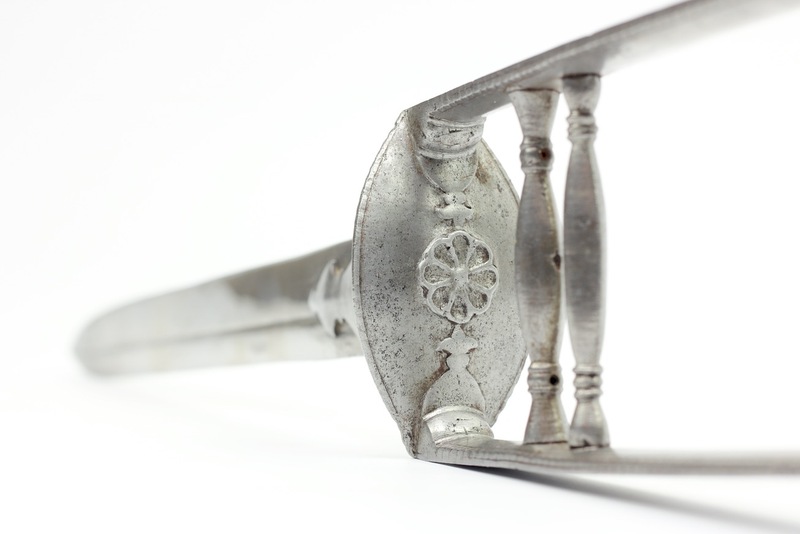 Such blades were imported in some quantity and were very popular in South India in the 17th century, and used to fit several weapons including katar but also larger swords like the patta gauntlet sword. When used on katar, the blades are often considerably shortened, on this example. The handle is of typical south Indian form, the blade being held by two langets on an oval, hollow base. Typical also for southern work of the time are the side-bars that terminate in a small finial, something also often seen on early Vijayanagara hooded katar. The two handle bars that sit between the side-bars are of elongated melon shape, the next step in evolution from the ball shaped handle bars of earlier katar . The edges of both side-bars and the oval base are ribbed, a hint towards the beaded rims often seen on arms associated with the Tanjore armory. 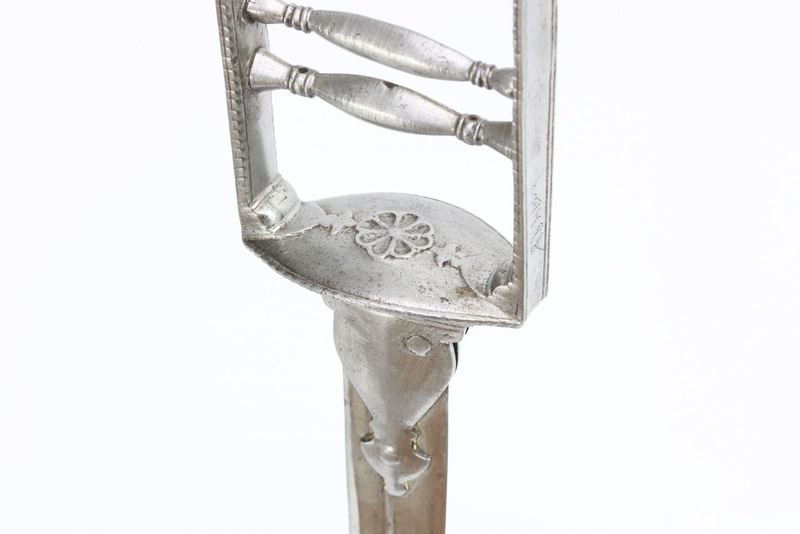 While exhibiting all the hallmarks of southern work, this did make its way to the Bikanēr armory in Rajasthan where it got the typical punch-dot marks found on items from this inventory. Part of the armory was sold to several British antiques dealers in the late 20th century, and pieces with these armory marks have been circulating ever since. One of the more famous pieces is a shirt of mail and plate in the Metropolitan Museum in New York, accession number 2000.497. 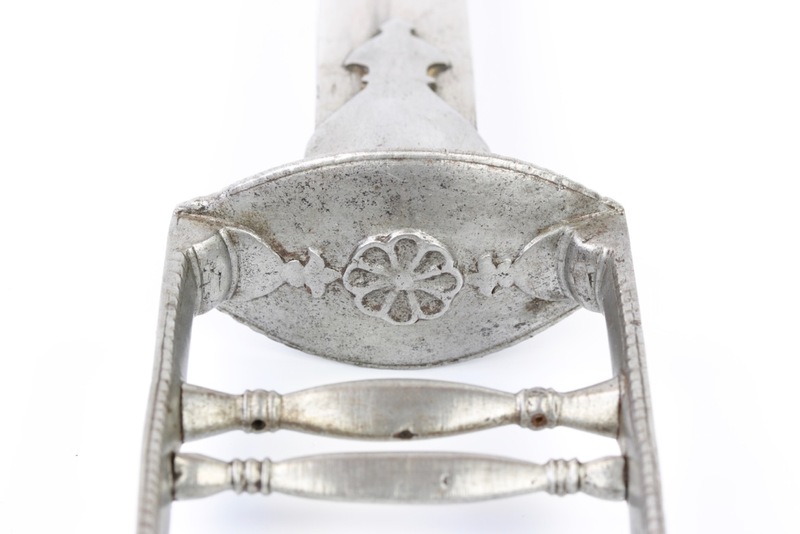 It seems that our katar may very well have similar provenance, and was incorporated into the Bikanēr armory as booty from one of these southern campaigns. Stylistically it is of a type we expect to have been used at that time, in that place. The katar in the Royal Danish Kunstkammer. 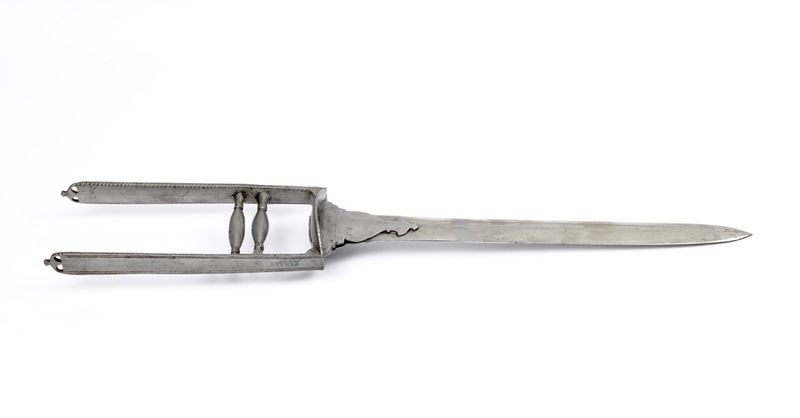 The items from the Bikanēr armory tend to be very well-preserved, commonly found in an almost over-cleaned looking state with bright, shiny blades and almost spotless handles. This all-steel katar is no exception: all surfaces have been kept polished and the blade is burnished to a bright mirror-like sheen. It may look too clean to the novice collector, but those who have seen enough Bikanēr items know that this is the state they are commonly found in. 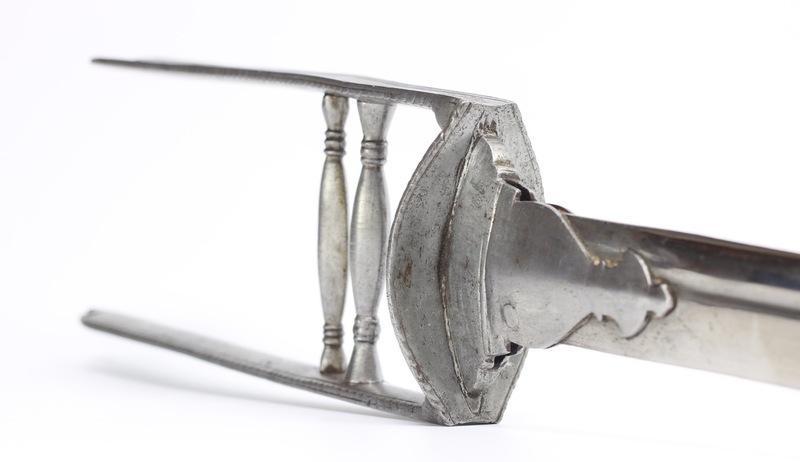 An interesting South Indian katar of the 17th century, of typical form and with European blade common on South Indian arms from this period. It somehow made its way to the Bikanēr armory in Northern India, possibly taken as booty in one of Anup Singh's campaigns in the late 17th century. A fascinating piece of history, in excellent condition. 1. This mail shirt is described in detail in David E. Alexander and Stuart Pyhrr; Islamic Arms and Armor in The Metropolitan Museum of Art , Yale University Press, 2015. Pages 46-47. 2. Bente Dam-Mikkelsen & Torben LundbÆk. (editors); Etnografiske genstande i Det kongelige danske Kunstkammer 1650-1800 (Ethnographic objects in the Royal Danish Kunstkammer 1650-1800) KØbenhavn : Nationalmuseet, 1980. Object number EAb38. Pages 106-107.